Marketing automation company Blueshift announced the launch of a technology platform Tuesday that allows B2C marketers to build what company executives calls a recommendation engine. Blueshift’s Personalization Studio allows marketers to send custom messages to the correct audience at the ideal time. Vijay Chittoor, CEO and cofounder of BlueShift, told Email Marketing Daily that the company's technology resides at the intersection of Big Data, marketing and ecommerce. In a product demo, Chittoor highlighted the user interface that allows marketers to customize their campaigns as well as the metrics. The key challenge of email personalization, says Chittoor, is to understand the consumer and determine what they are thinking at different points during their purchase journey, and then react accordingly. Product recommendations and merchandise marketing should reflect those varying attributes, he says. 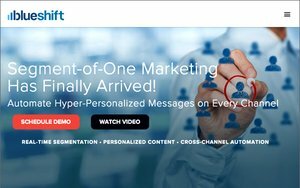 To solve this issue, Blueshift helps marketers personalize messaging with custom segmentation across email, display, mobile and Facebook advertising. The company offers finite data attributes to relay real-time customer mobile and online behavior. Personalization is the key to successful email marketing, according to a panel discussion Tuesday led by MediaPost Event Director Steve Smith. Representatives from ArcBest Corporation, IBM, Daybreak Games (formerly Sony Online Entertainment) and Fullscreen explained how their companies were pivoted toward more personalized email marketing. The transition from batch-and-blast campaigns to personalized email marketing was a predominant theme at MediaPost’s Email Insider Summit this week in Amelia Island, Florida. Leanna DeLeon, manager of optimization and analytics at freight moving company ArcBest Corporation, discussed how ArcBest Corporation personalized outreach to members of the military by identifying .mil email addresses. When data pinpoints a military member moving from one town serviced by ArcBest Corporation to another, the company sends out personalized promotions for moving services. Kevin Pollack, digital strategist at IBM, discussed how the 104-year old company did not traditionally look at email as a key thing. Many IBM customers leveled email as a method to nurture customers, but with simple transactional emails and triggered email series that don’t reach the level of one-to-one personalization. “We’ve got a lot of work to do and we’re really trying to accelerate that,” says Pollack.